Some great electric fireplace ideas with a TV above for your viewing pleasure. Making your dual-purpose entertainment center is easy with a beautiful electric fireplace and flat-screen TV! Today, we are seeing more great electric fireplace designs. And along with lightweight, streamlined flat TVs, it’s much more fun to design our homes and offices. 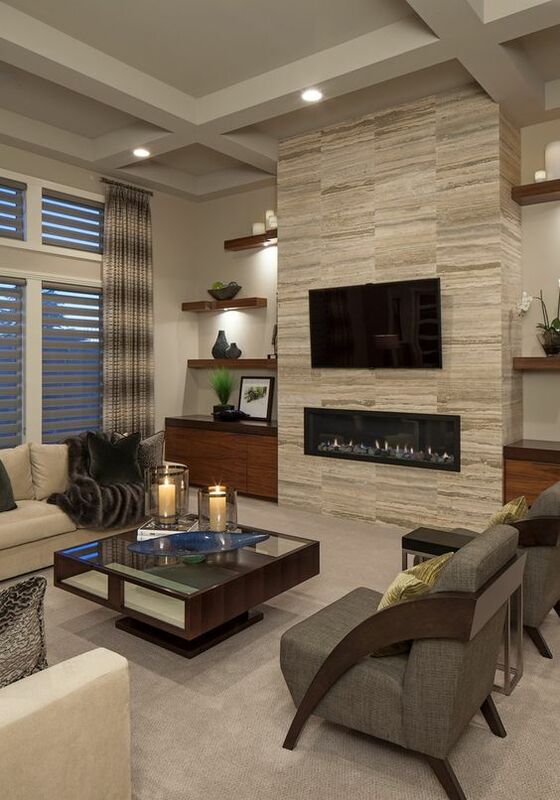 Hanging a wall fireplace with a TV above does make a more interesting visual centerpiece. 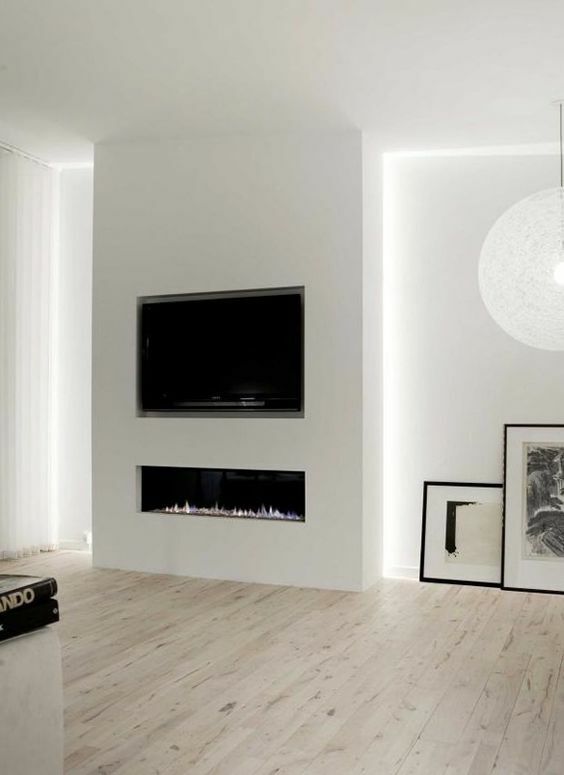 Take a look at these captivating electric fireplace ideas with a TV above. Whether you just want to watch some shows or enjoy some beautiful flames, these dual designs are sure to wow you. A simple yet stylish design by Home My Design. White perfectly surrounds that beautiful linear panoramic fireplace. The plain background will definitely highlight the colors from both the wall mount fireplace and TV. Here’s another design from Decoist that features flat screens with electric fireplaces. In this room, the designer opted for a stunning floor-to-ceiling treatment of modern cream quartzite stone! 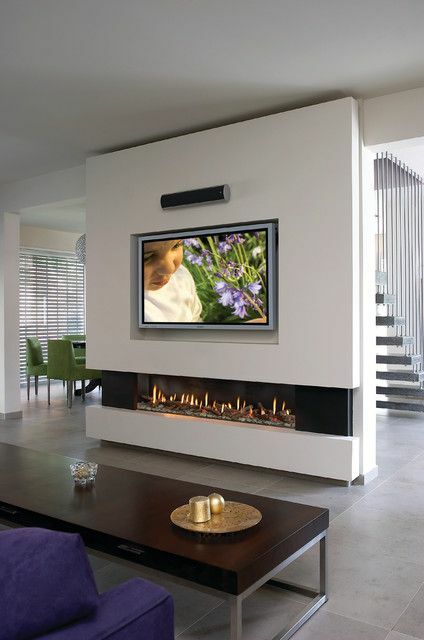 A wall mounted fireplace below a TV design is becoming a super popular look. Going electric opens up a lot of ways on how we can design our fireplaces. This design by Decor Snob contributes to a very minimal and contemporary style. 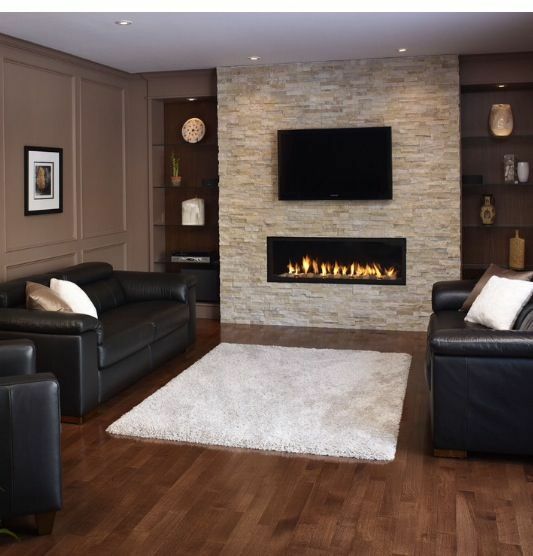 Complete your built-in wall with an electric fireplace, mounted TV and shelves. Angie’s List definitely gives all these elements a heartwarming mix! Here’s another great addition to electric fireplace ideas with TV above from Decoist. Aside from stone slates surrounding the electric fireplace, it highlights glass to come with the flatscreen. Great concept! Finally, take a look at this design by Architectural Art Designs. This style creates a relaxing and pleasant atmosphere in this living room. The panoramic linear fireplace complements whatever you watch on the TV. Here’s a final design tip: Make sure that your TV far enough from the fireplace according to the manufacturer specifications, but is also low enough for comfortable viewing. After all, you don’t want anybody straining their necks, right? Shop our Electric Fireplaces Collection here. Be the first to receive discounts, ideas and promotions!